One of my husbands many cousins is getting married in October at a suburban synagogue. Afterward they’ll have a dinner reception at a hip downtown spot. I have found a knee-length shift dress with a Pucci-like print in fall colors (olive, deep orange, beige, and banded with black at the neck and hem). Please can you suggest something appropriate. Manolo says, this wedding, it sounds like exactly the sort of celebration of which the Manolo approves: the traditional ceremony followed by dinner at the good restaurant. Yes, the Manolo also enjoys the big $200,000 blowout, the sort which features liveried footmen delivering the bride and her monster gown in the silver sedan chair, while the prop husband stands there waiting, looking earnestly befuddled in his cutaway and ascot. Still, the Manolo finds that in the midst of such Hollywood spectaculars he often longs for the sort of wedding that our grandparents knew, small affairs with the bride in the modest white dress and the groom in his best black suit, followed by the awkward celebratory dinner at the Italian restaurant in Hackensack. 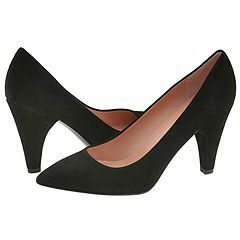 Here is the respectable but fun black suede pump from Marc by Marc Jacobs, something perfect for the ceremony and the reception to follow. This entry was posted on Friday, October 12th, 2007 at 7:41 am by Manolo the Shoeblogger and is filed under Marc Jacobs, Pumps/Court Shoes. You can follow any responses to this entry through the RSS 2.0 feed. Both comments and pings are currently closed.